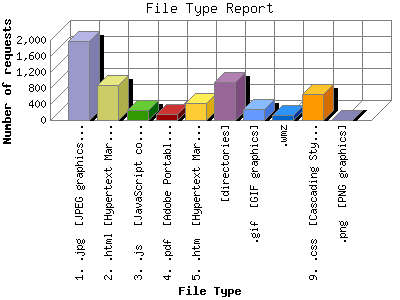 The File Type Report identifies the type of information that is requested from the web site. GIF and JPG are the two types of graphic (image) files that are most commonly supported by web browsers. HTML (sometimes abbreviated HTM), ASP, and [directories] all represent actual pages. The number of image requests will almost always outnumber page requests as one page may contain several images. This report shows results with at least 0.100000 percent of the total bytes. This report is sorted by amount of bytes transferred. This report was generated on May 28, 2009 07:24. Report time frame December 18, 2008 01:28 to May 27, 2009 23:24.